Cmdr. Jade L. Lepke will be the first consecutive Naval Commander to take charge since 1995, when VT-3 began alternating Air Force and Navy Commanding Officers. Lepke, Conatser’s executive officer, will take charge of the command at the end of the ceremony. Under Conatser’s command, Training Squadron THREE flew more than 42,249 hours, 30,300 sorties and completed more than 580 Student Naval Aviators. Furthermore, the Red Knights safely operated as a detachment on three separate occasions, to include Chief of Naval Air Training's first squadron-led T-6B detachment, successfully relocating and operating 15 aircraft in Alpena, Michigan. The detachments significantly reduced time-to-train and increased student production by more than 18 percent. Moreover, VT-3 improved the quality and safety of flight instruction by developing a comprehensive instructor training guide and training program, resulting in enhanced instructional techniques and improved standardization within the squadron. Conatser's emphasis on high quality training and a safety-first culture was evidenced by VT-3 earning the 2013 CNO Aviation Safety Award. 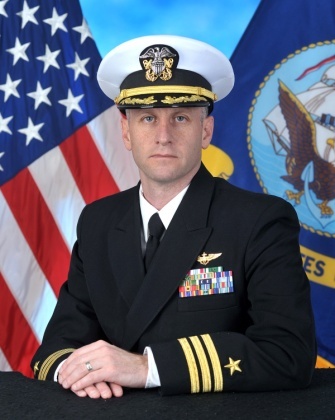 Conatser took command of VT-3 after nearly 18 years of Naval service. He is a graduate of the United States Naval Academy and earned his wings of gold in 1998. Following training at the P-3 Fleet Replacement Squadron, Conatser reported to the Fighting Tigers of Patrol Squadron Eight in Brunswick Maine. He followed that tour with service as a Fleet Replacement Squadron Instructor Pilot in VP-30. His next assignment was as the Assistant Strike Operations Officer onboard USS Abraham Lincoln (CVN 72), flying missions to support operations Iraqi Freedom and Enduring Freedom. Finally, he served at the U.S. Africa Command in Stuttgart, Germany where he served as the Support Officer and Focal Point Program Control Officer, before his transfer to VT-3 as the executive officer. Lepke takes command of VT-3 after 24 years of naval service, which began when he enlisted in 1991 with the South Dakota Air National Guard as an Aircraft Armament Systems Specialist on the F-16C. Following his graduation from University of South Dakota, Lepke attend Officer Candidate School, and earned his wings of gold shortly thereafter in 1998. Lepke was assigned to HSL-40 for training in the SH-60B helicopter. In July 1999, Commander Lepke reported to the "Proud Warriors" (HSL-42), where he deployed to the Arabian Gulf and Mediterranean Sea aboard USS Samuel B. Roberts (FFG 58). He followed that tour as a HT-18 flight instructor pilot and in 2004 was selected as Instructor of the Year. His second tour began on the USS Theodore Roosevelt (CVN-71), where he deployed to the Arabian Gulf in support of Operation Iraqi Freedom and Endruing Freedom. He then joined the "Battlecats" of (HSL 43) where he completed missions in Joint Interagency Task Force South Counter Drug Operations in the Eastern Pacific. Following his operational Department Head tour, his next assignment was to United States Strategic Command (USSTRATCOM) in Omaha, Nebraska. As a member of the Joint Functional Component Command - Global Strike, he served in the Nuclear Plans Division/Aircraft Strike Branch and was the Global Strike NATO Plans Team Chief until his departure in July 2013. Commander Chris Biggs will replace Lepke as the executive officer for the squadron.